I am now a firm believer in fate. Take some time to check out Pink Parsley, a really great blog. I think I've bookmarked almost every other recipe. In fact, I made this one for dinner tonight. Check back later in the week to see how we liked it! Melt butter in a large saute pan over medium-high heat. Add the onion and saute about 4 minutes, until softened. Add the mushrooms, garlic, salt, and Worcestershire sauce, and saute an additional 5 minutes. Add the white wine and pepper, and cook until most of the liquid has been absorbed, at least 5 minutes. While the mushrooms cook, coat a griddle or large skillet with cooking spray and heat to high heat. Reduce heat to medium when it is preheated. Lay a tortilla flat on the cooking surface, and sprinkle 1/4 cup Monterey Jack cheese over the whole tortilla. 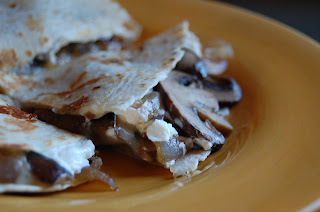 Top half with about 1/3 cup of the mushroom mixture, then sprinkle with a thin layer of goat cheese. Use a stiff spatula and fold each tortilla in half. Cook until light brown and crisp on the bottom, then carefully flip and cook until the other side has browned. Transfer to a plate and keep warm in the oven. Repeat with remaining tortillas. To serve, cut each into 3-4 wedges, and serve with salsa for dipping. These looks fabulous, I think I will make these on next weeks Menu Plan. They were wonderful I'm already trying to justify another trip into town today for more mushrooms! LOL! You are so sweet - thanks so much for the shout out! I love those quesadillas!